Composed by a Raptor master and a console, the Raptor C-05 is the smallest fully functional Raptor configuration. It is adequate for numerous test and measurement functions involving medium- to moderate current and where the distance to the tested device is not a factor, as when testing MCBs or medium-sized MCCBs. 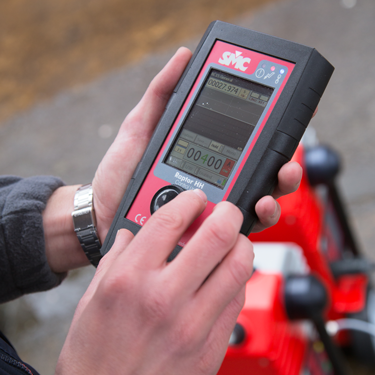 The Raptor C-05 can comfortably work in the range of 500 A using a narrow connection (around 25 sq. mm), which also enables the user to make two or more turns through the pass-through hole to increase the compliance voltage when testing on higher loads. The output frequency can be varied between 20 and 400 Hz, which allows the filtering of undesired interferences from the surrounding high voltage when doing precise, small magnitude measurements. The auxiliary output, binary input and measurement functions are automatically configured by the standard set of test templates, so the user only needs to enter one or two parameters to easily test a transformer, a circuit breaker or a protective relay to mention just a few examples. 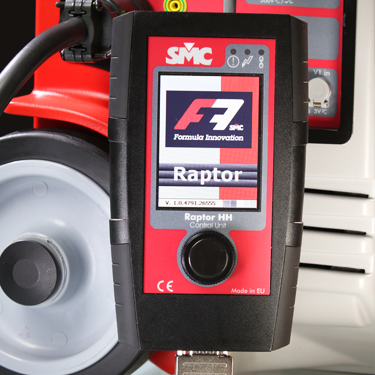 This functionality is standard in the Raptor master, so it is available also in more powerful Raptor configurations. 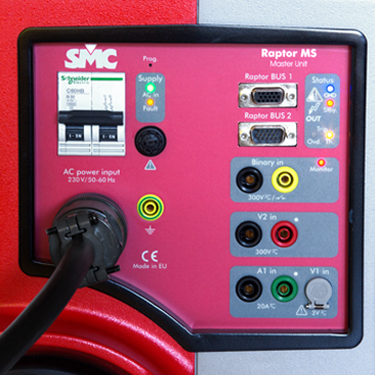 The Raptor C-15 features the entire functionality of the C-05 and supplies 8 kVA power for medium-to-high current injection on moderate loads when making several conductor turns is not practical or when the system cannot be placed close to the receiver, thus imposing the use of a longer cable. 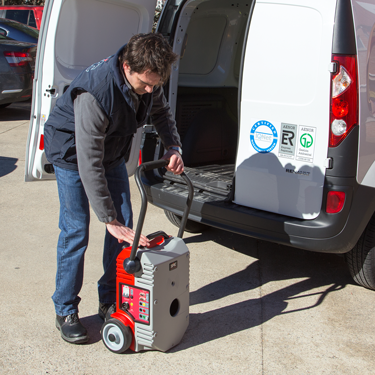 The Raptor C-25 features the entire functionality of the C-05 and supplies 13 kVA power to attain high current on heavy loads when doing multi-turn is not practical and / or when longer or narrower connections are imposed by the shape or the position of the load. This configuration is called to be the favorite for most high current applications. 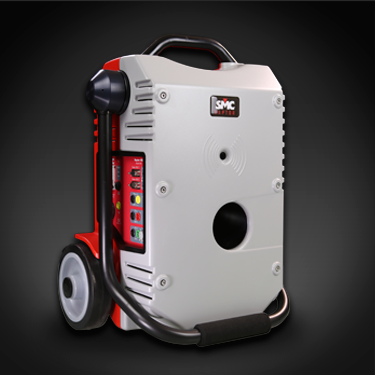 The Raptor C-35 features the entire functionality of the C-05 and supplies 18 kVA power for cases where the distance to the tested object cannot be reduced. This setup can comfortably sustain current values above 8000 A when cables with the appropriate section are used. The Raptor MS is the master unit of any Raptor configuration. 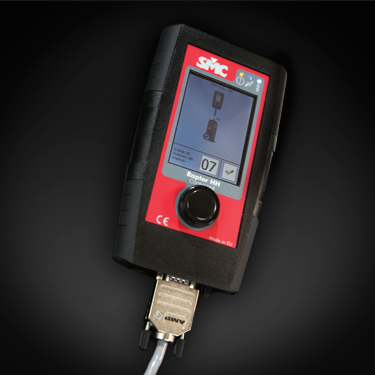 It provides the connection for the touch screen console and can be used as stand-alone for primary test applications that do not require extremely high current. When slave units are added, the MS will detect them automatically over the infrared link and will accommodate the system’s parameters with no intervention from the user. 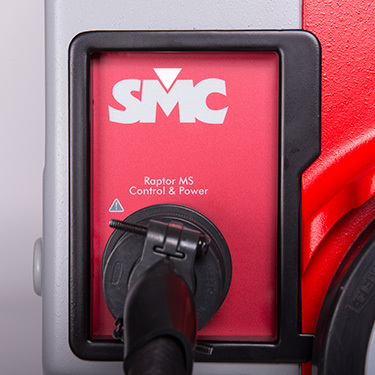 The Raptor MS features a digital waveform generator driving a 3-kVA switching amplifier designed for a maximum 15 kA throughput. The amplifier’s output is applied to a toroidal winding that surrounds the Raptor’s pass-through hole internally. A concentrically aligned Rogowsky sensor measures the current inside the hole, providing continuous feedback to the amplifier for dynamic compensation of load or supply variations with an accuracy better than 1%. In addition to the 20-400 Hz variable frequency and to the high current output which is common to all Raptor units, the MS features a 2000-VA auxiliary output that supplies up to 35 A in current mode and up to 200 V in voltage mode, as well as measuring inputs for external AC or DC, including a high sensitivity 0-3 V input. As an alternate method for trip detection, a binary input is also provided to monitor the activity of a dry contact or energized point in the object being tested. The input is sensitive to voltage for automatic mode switching. Finally, the MS includes a system expansion connector for future developments. The factory- or user-defined test templates pick up only the necessary among all these test and measurement resources for each type of job, so that the user only needs to select a template from the menu and start the test. The standard list includes templates for circuit breakers, current transformer, trip testing, low impedance, ratios, reclosing and many more. This approach provides a cleaner screen layout, because the user is presented only with the data that is needed for each specific task. 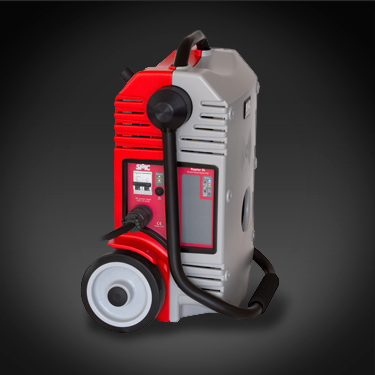 All Raptors are powered by single-phase 240 VAC 50/60 Hz and include an automatic thermal-magnetic cut-off switch for protection against internal failures. A protective nylon cover featuring a generous pocket for accessories is also included as standard. 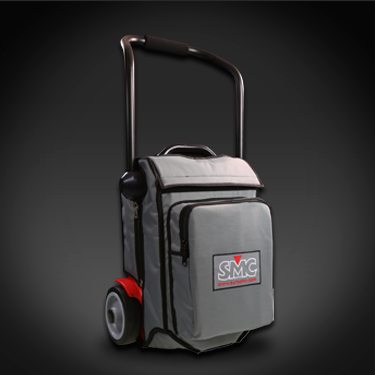 This cover leaves the foldable handle and the wheels uncovered for easy transportation and can be quickly removed for working. Infrared communications link to slave Raptors. Current mode: 0 – 8.25 A permanent, or up to 35 A for 3 seconds. 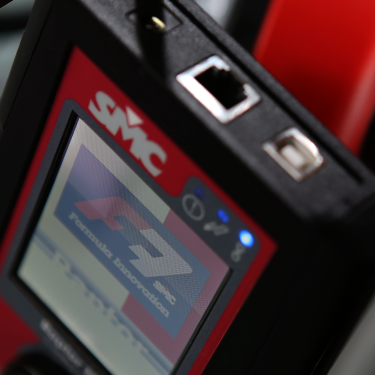 Voltage mode: 0 – 200 V.
RS-485 connection for touch-screen console and other compatible devices. Furnished to enable additional functionality with future add-on equipment. The slave Raptor is visually identical to the master unit but lacks the amplifier, the handheld controller and the auxiliary input/output panels. 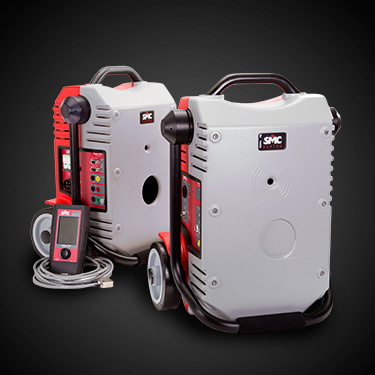 Its only mission is to push an additional 5 kVA power from the mains input to the high current pass-through secondary. 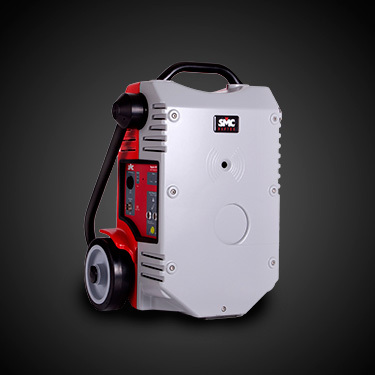 Up to three slaves can be added for up to 15,000 A with a 18-kVA total injection power. 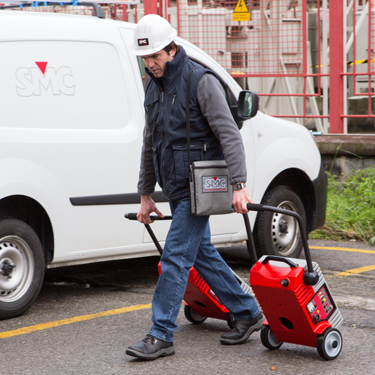 The master unit detects the presence of slaves using infrared communications, so no additional control or power interconnections are required. The user only needs to pass the current conductor across the entire assembly and use it as if it was a single device. As an added benefit of the pass-through secondary technique, the user can easily multiply the compliance voltage by making more than one turn with the current conductor around the entire system. No need to disconnect / reconnect to separate output taps. The Rapor SL features two toroidal windings that are activated individually by the master unit as the power demand grows. If two or more slaves are used, the master activates one toroidal in each unit first, then the second toroidal in all. 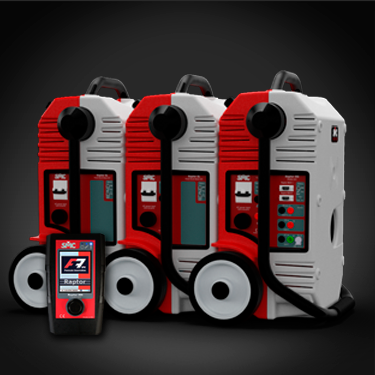 This sophisticated injection control ensures seamless current flow and optimal workload distribution. Infrared communications link to master Raptor. 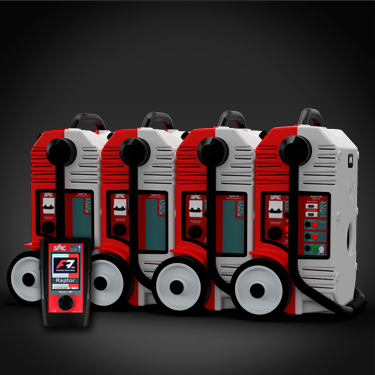 Power-on, injection, protection and communications. Whereas the master Raptor is the heart of the system, the Raptor HH console is its brain. This handheld computer, which permanently stores the operation software, the work templates, the user preferences and the test results, features a touch-sensitive screen and a rotary encoder with push function for a friendly, efficient and easy to learn operation. The Raptor HH can be detached from the test unit and connected to a USB port in any Windows PC for data downloading, and also to a standard LAN plug for network-based operations like, for example, direct software updates. 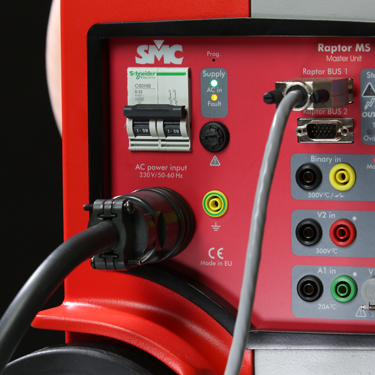 The Raptor HH is connected to the master Raptor through a 5-meter cable that allows the user to stay at a convenient location while the test set is working much closer to the load. For extreme cases, a 4-meter extender is available as an optional accessory. The console’s back is magnetized, which allows the user to snap it quickly and safely on any iron surface for a more comfortable operation. 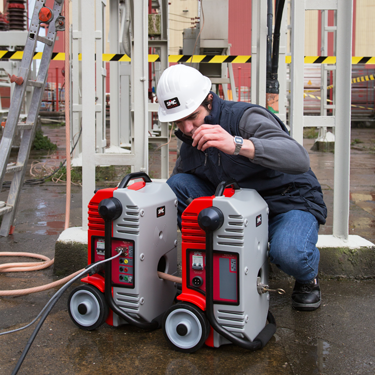 The Raptor HH’s buit-in software is multilingual, detects and configures the slave units automatically and only prompts the user for the number of turns made with the high current cable. After this simple start-up sequence, you only need to choose a test template from the menu, enter a few (if any) parameters and depress the rotary encoder. The test results are displayed immediately upon test completion and permanently saved into a report container. Some safety tasks like winding de-magnetizing are conducted automatically while a ‘please wait’ message is displayed. A simple to use yet sophisticated tool (which can also be installed on a Windows PC) allows the user to quickly determine the master/slave configuration and the cable type required as minimum to successfully accomplish a specific high current job, even before leaving the desk. Factory-defined test templates: Breaker trip test, reclose sequence test, CT magnetization curve, TTR, power factor measurement, sensor calibration, ground grid measurement, and more. Download utility for results archiving, retrieval and reporting. 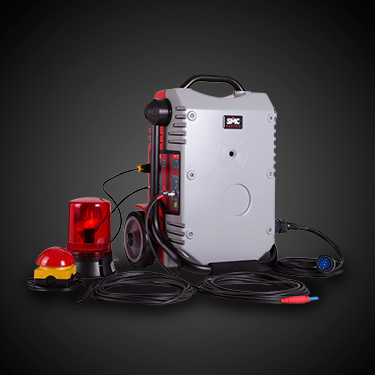 These products are meant to better adapt your Raptor to most working conditions. However, we will be pleased to study any special solution if your particular application requires it. 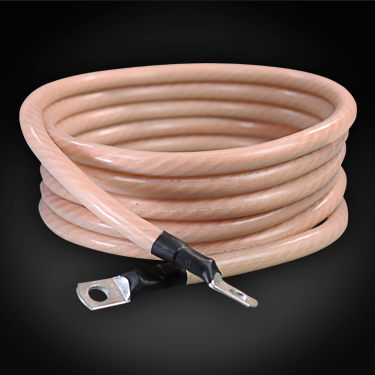 This copper braid, silicon coated 120 mm2 cable allows you to squeeze the highest performance off your raptor system, especially when putting the multi-turn technique into practice. 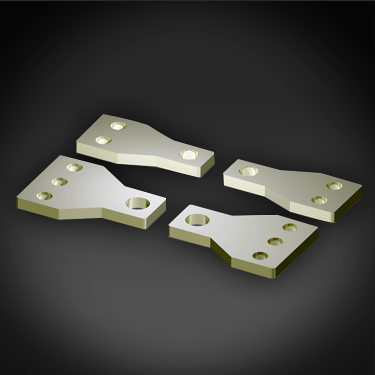 The pre-cut lengths are finished with pressed steel terminals, drilled for M12 bolts. 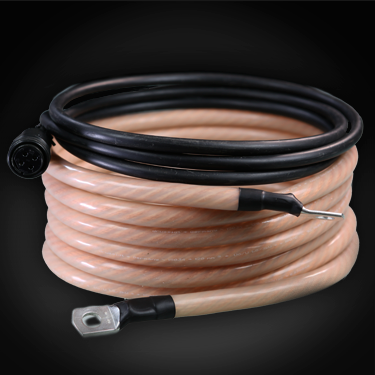 This cable will withstand a permanent 500-A injection or shorter 1,000 A (3 min.) or 2,000 A (3 sec.) tests. Available lengths: 3, 6 and 9 meter (9, 17, and 26 ft). Order codes: CBL3M-RAP, CBL6M-RAP, CBL9M-RAP. These copper terminals allow the connection of up to 4 or 6 120 sq. mm cables in parallel for a wider effective section. Order codes: RAP-ACC1, RAP-ACC2. If you need to stay at a distance greater than 5 meter from the master Raptor, use this 4-meter extension for the RS-485 communications cable. Order code: CBL-HH4M-RAP. Safety accessory compatible with the Raptor HV. The spinning lamp is automatically activated whenever high voltage is present in the system. Safety accessory compatible with the Raptor HV. 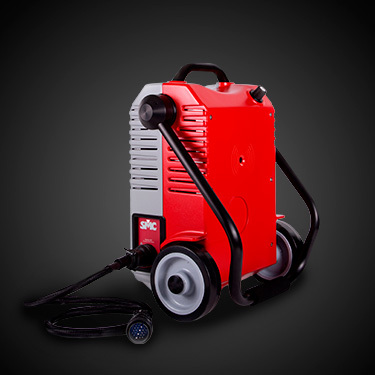 Allows the immediate interruption of high voltage output in case of an emergency. 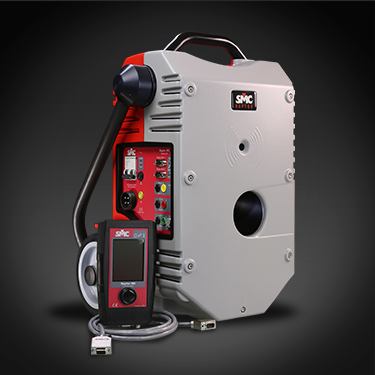 HIGH VOLTAGE AC OUTPUT UNIT UP TO 2 KV. 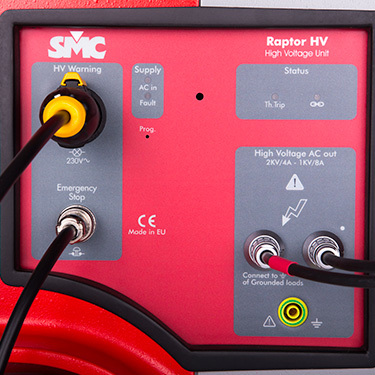 Test requiring a moderately high AC voltage can be accomplished by connecting the Raptor HV unit to the master unit of any existing Raptor system. 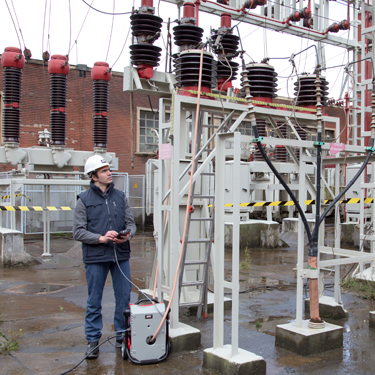 The 20-400 Hz variable frequency feature, included as standard in the Raptor, can also be used for high voltage tests. The user can select any of the HV templates included in the Raptor master’s control console, or create a new one, and proceed with the testing. 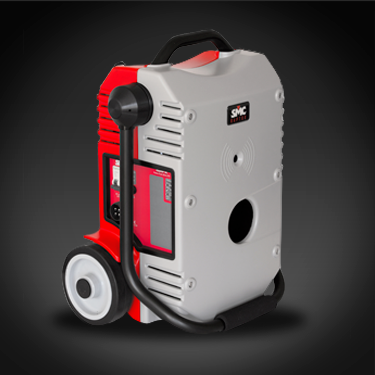 The Raptor HV takes the necessary power from its interconnection to the master unit, so no additional AC outlet is required. An audible warning signal is automatically activated when high voltage is present as a safety measure. The Raptor HV also includes clip-in connections for a spinning warning lamp and an emergency stop button. If you own high current Raptor SL slave units, you only need to set them aside and connect the Raptor HV to the master unit to proceed with your HV testing. 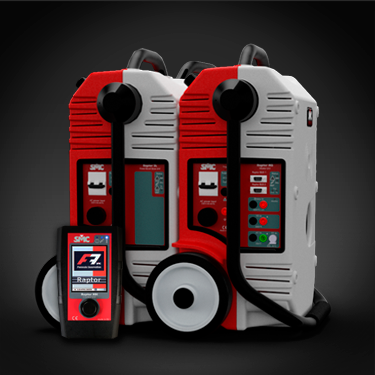 •	CT, VT and PT withstand voltage tests. •	CT and VT excitation current measurement. •	VT and PT ratio measurement. •	Polarity test in VT’s secondary winding. 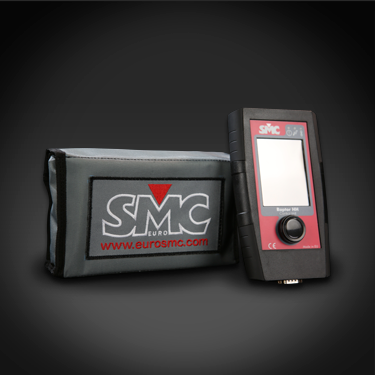 •	Step & Touch Voltage Measurement. •	Testing voltage sensors and converters. 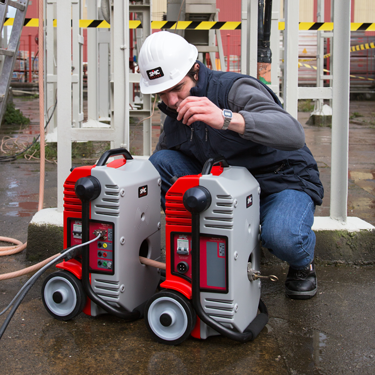 The Raptor-HV, also called the high voltage slave, is an optional product that extends the Raptor’s applications to tests that require the use of a moderately high AC voltage. This product can work only in combination with a Raptor Master and is visually similar to it. The Raptor HV connects to the master unit via the Expansion Port, from where it also takes the necessary power. You can think of the Raptor HV as a pluggable high voltage peripheral that takes advantage of all the valuable features in the Raptor Master including the electronically controlled switching amplifier, DSP based intelligence and a robust communication and device synchronization system. Naturally the HV’s control is fully integrated in the master’s console. The voltage signal generated by the master at the expansion port is raised by the HV up to two user selectable ranges, 1kV and 2kV, and the output is measured in current, voltage and phase angle to provide adequate injection control and application’s feedback. 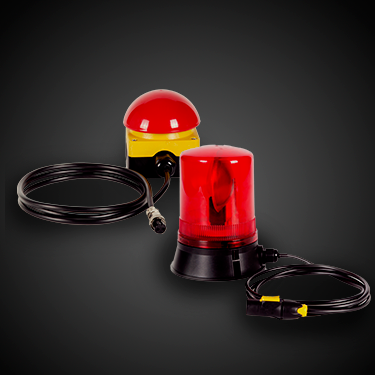 In order to comply to international safety requirements, the Raptor HV’s package includes an internal buzzer that signalizes the high voltage output activation and two connectors for an optional spinning warning lamp and an optional mushroom type emergency stop breaker. The internal buzzer can be muted from the Raptor’s console.